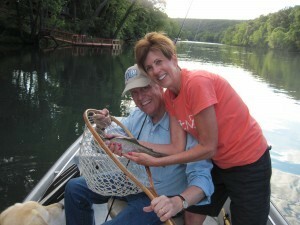 We had a great weekend fly fishing with Bo’s old and dear friends, Philip and Leigh Merry, from Fort Smith, Arkansas. Philip owns Gallagher Merry Insurance Company and he and Bo have done business together for many years. Bo and Leigh have know each other since the first grade in elementary school. Growing up Leigh did a lot of spin fishing and bait casting with her Dad and her grandfather, Pop Donoho, served on the Arkansas Game and Commission board for many years. Anyway, this was the first time fly fishing for both of them and we had a really nice weekend. After spending a little time with some casting instructions they both got the hang of roll casting so we got on the river. Due to all the rain we have had the river was a little high but regardless both Leigh and Philip got hooked up with their first trout on a fly rod. 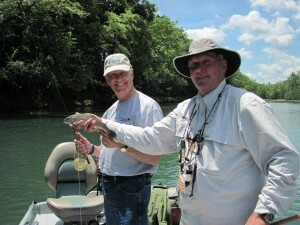 The top fly was #14 Purple Haze Sowbug and both anglers released a good number of nice fat Rainbow Trout. You can see several more photos of Philip and Leigh’s trip in the “Gallery” section of the web page. It was a great weekend with good friends and there is no doubt they will be back to fly fish with us again real soon.